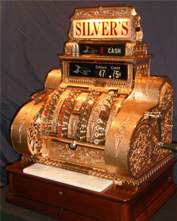 America's Foremost Procurer of Antique Cash Registers. 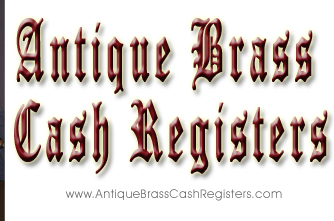 An Antique Brass Cash Register would look perfect in a recreation room with a bar or pool table, or even if you want to enjoy it in your favorite room or perhaps as a unique gift for the person who has everything. You'll own a unique piece of history that is becoming rarer and rarer and is going up in value every year. Click the image below to see video "As seen on News 12 Long Islands East End Show". One glimpse and you'll just have to own one. An Antique Cash Register is a perfect complement to a Game Room, Pool Table or Victorian Bar. An authentic piece of history appreciating in value every year. A unique gift for that special person who has everything. Without passion there is no interest and without interest there is nothing going on. I am the 3rd generation of a cash register family. My grandfather was a repairman for NCR.... See a large variety of Antique Cash Registers Forty hours of painstaking mechanical and artistic restoration make each antique cash register a valuable historic treasure.